Decades, sexes and styles collided in this playful collection. Dries Van Noten has never really been known to have fun with his clothes. Yes, he has on many occasions played with prints, ethnic origins and beautiful combinations. But he's never been overly reckless with his clothes and there was something of a drunken teenager hiding in the mix and matched ensembles that were presented in the latest collection. There wasn't a complete loss of control but it was freeing to see Dries Van Noten ease into khaki elegantly, paired with mannishly cut jackets and oversized clutches. The slouchy sweater slipping off the shoulder became the perfect accompanying piece to his prints that this time came in dashes rather than heaps, with an emphasis on brushstroked florals. The contrasts didn't end there as intricate silver embroidery ran up sleeves that led to parka jackets and touches of leopard print on scarves and swing jackets touched on both 50s old school glamour as well as 60s beatnik girls. In short, van Noten treated his prints to a trip down the "streets" that traversed various periods and styles and ended up broadening his own vocabulary. Dazed Digital: Tell us about the contrasts you were playing with throughout the collection. Dries Van Noten: Yes, there were contrasts; Masculinity with femininity, colour with non colour, military with embroidery...I wanted to make a very playful collection. It's my rebellious side coming through! Last year, fashion became so serious and quite narrow-minded with these specific statements and I just want to have more fun with fashion. You take sleeves of one thing and put it on another, you wear it with whatever pants you like and you still look elegant. DD: It was kind of like a streamlined patchwork - how did you balance all the different elements in the collection? Dries Van Noten: It's something really personal. I really love the idea of something like a casual pant with a precious silk coat but then you don't liket he colour and then you take a brush and paint it with a different colour. When you have the whole era of punk influencing it, it's really spontaneous and I really wanted to bring that back into fashion. DD: Was it a conscious decision to focus less on prints this time? 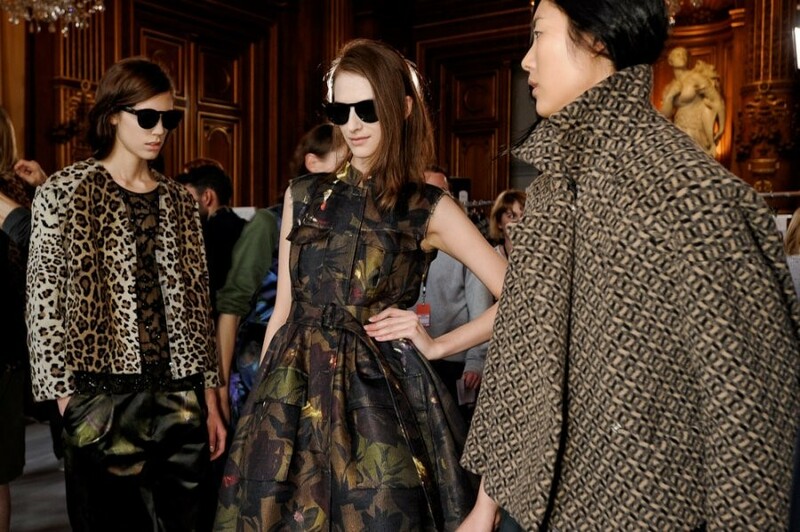 Dries Van Noten: I worked so much on the combinations of shapes and the combinations of everything. If we put too many prints, the shapes would drown out and people only see the colours and the embellishments and not the structures that we made I think.